The Skytap Cloud Speedtest now uses HTML5 instead of Flash to check your network connectivity to our regions. The updated version is located at the same URL as the previous Speedtest site: http://speedtest.skytap.com. The Java-based Firewall and Packet Loss tests that were part of the previous Flash-based site have been retired. For more information about using the new Speedtest and interpreting the test results, see Testing bandwidth and latency with Speedtest. Skytap has made behind-the-scenes changes to improve the speed and performance of auditing reports. For information about these reports, see Generating audit reports. Power VM usage is now displayed on this page. Power VMs are available to support AIX workloads. The UI controls for enabling, disabling, or editing bursting capacity have changed from a link to a gear icon. For more information about this page, see Account usage overview – Current Usage page. Skytap has removed non-recoverable class error states (Provisioning error, Starting error, and Shutdown error) from the Skytap Cloud Classrooms extension workflow. If the Classrooms extension encounters an error while automatically creating a lab or changing the runstate for a lab environment, it will add an error message to the lab and continue with the automated actions on the remaining labs in the class. The class status shows where the class is in its scheduled lifecycle (Scheduled, In Progress, Expired, etc.). Each lab provides more granular information about its status (Provisioned, Started, Deleted, etc.). For more information, see Check the status of a lab. Lab errors are recoverable from either the Skytap web interface or the Skytap Cloud Classrooms extension web interface. Most errors can be resolved by retrying the provisioning step or manually changing the VM or environment runstate. To more easily locate classes with any type of error, we’ve also improved the Error status filter. This now shows any classes that have 0 labs, a missing template, or lab environments with error messages. For help viewing and resolving errors, see Troubleshoot issues with classes or lab environments. The Skytap Cloud Classrooms extension adds lab and class management features to your Skytap account. To learn more, see Skytap Cloud Classrooms extension. To learn more about pricing, contact your Skytap sales representative. The October 2017 release features AIX General Availability (GA). These virtual machines can be added to existing environments, or used to create new environments in Skytap. If you’d rather import AIX LPARs from your on-premises data center into Skytap, see our import instructions. Skytap virtual environments let you manage multiple virtual machines and complex networks as a single unit. Your environment can contain a mix of x86 virtual machines (featuring Linux and Windows operating systems) and Power virtual machines (featuring AIX operating systems). The environment can be copied, saved as a template, and shared with other users. The Skytap user interface displays the types of VMs in the environment. 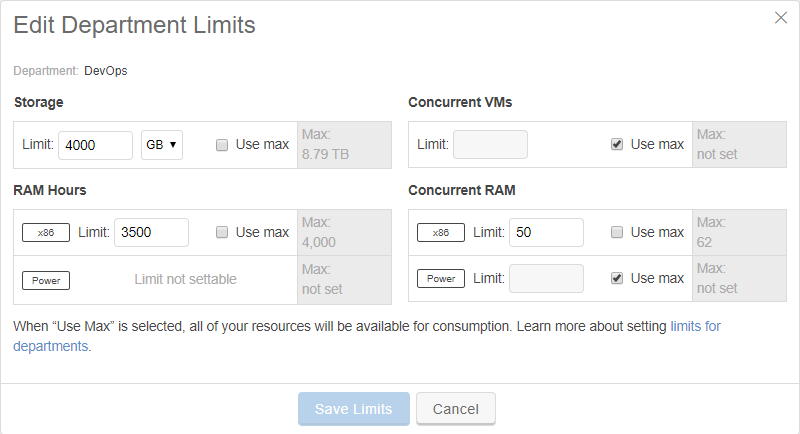 Administrators can add user and department usage limits to control Power SVM usage in the account. Additionally, Skytap Cloud usage reports have been updated to show usage by type (x86 SVMs and Power SVMs). To edit user and department limits, see Setting usage limits. To view current usage or generate usage reports, see Account usage overview - Current Usage page. To enable your account for AIX, contact your Skytap sales representative. Information about current, account-wide usage has been added to a new Current Usage page for administrators. This page provides a visual presentation of the usage information and limit controls on the Settings page. View the current billing cycle and the regions enabled in your account. Enable or disable usage “bursting” above the account subscription limit. Export a CSV report with information about current usage and limits for each type of usage, or provide feedback about the new design. For more information, see Account usage overview - Current Usage page. The Usage page has been renamed Reporting. The Reporting page is used to generate custom reports about past usage in your account. For more information, see Generating usage reports. The usage module on the dashboard has also been updated to match the new current usage page. In the company limits section, any usage over the account subscription limit is displayed in the new bursting usage bar. The amount of the resource available for use. The amount of the resource currently in use. The subscription limit for the resource. The amount of resource over the subscription limit available for use (the burst limit). The amount of resource over the subscription limit in use. For more information, see the Guide to the Dashboard. The SRA browser client now gives Skytap Cloud users or sharing portal users the ability to change the VM Keyboard layout. The on-screen keyboard displayed when Show Keyboard is selected. How the keystrokes from the user’s local keyboard are interpreted by the VM. For best performance, the keyboard layout setting should match the user’s local, physical keyboard and the language settings in the VM guest operating system. For more information, see Using an international keyboard with a VM.. This setting affects only the individual user’s SRA browser session. It does not affect other users’ SRA sessions to the same VM, and it does not change the Keyboard mapping setting on the VM hardware settings page. Skytap Cloud now supports the following additional keyboard mappings in the SRA browser client. For best performance, your local keyboard should match the selected Keyboard layout and VM guest operating system language settings. For more information, see Using an international keyboard with a VM. Automatically run and shut down lab environments each day in a multi-day class. Creates a fully qualified domain name (FQDN) for the VM. The VM is accessible from the public Internet via this FQDN. Attaches a public IP address to the VM while it is running. Remove VM dependencies on shared public IP addresses; when you run a VM, it can use any available public IP address in your account. More efficiently use public IP address resources. The VM consumes a public IP address only while it is running; the public IP address is automatically released when the VM is suspended or shut down. This new option does not affect any VMs that already use static public IP addresses. Going forward, the public IP addresses in your account can be manually attached to VMs as static public IP addresses or automatically attached to VMs as dynamic public IPs by the managed DNS service. Additionally, you can continue to use other access methods (sharing portals, SRA browser client, etc.) with VMs that use dynamic public IP addresses with DNS. How does Skytap generate the VM DNS name? What is the difference between static public IP addresses and dynamic public IP addresses with DNS? Administrators: Learn more about managing static and dynamic public IP address in your account. Add lab environments for last-minute class attendees or remove lab environments for students who dropped the class. For more information, see Add or remove labs. Shut down your labs to limit SVM usage during periods of class inactivity. This setting can also be changed while a class is In Progress. For more information about this and other class settings, see Create and schedule a class. If you have access to the Classrooms extension, a new navigation item lets you easily switch between both sides of your Skytap Cloud account. What is the Skytap Cloud Classrooms extension? The Skytap Cloud Classrooms extension simplifies the process of creating and managing training lab environments with your Skytap account. The Classrooms extension adds new UI and REST API resources that automate and schedule bulk operations for building labs and adding student and instructor access. For more information, see the Skytap Cloud Classrooms extension help documentation. Skytap has added support for VMs on hardware version 11. These VMs can now be directly imported into Skytap. For more information about supported hardware versions, see Hardware version compatibility for importing VMs into Skytap. To check the current hardware version of a VM or to upgrade an existing VM to hardware version 11, see Upgrading VM hardware versions. For information about importing VMs into Skytap, see Importing VMs and vApps into Skytap. In the most recent beta update, Skytap has added AIX VM quota management. Now account administrators can use standard Skytap management tools to independently control user, department, and regional usage for both x86 and Power VMs. Storage quota is shared for all VM types (x86 and Power). 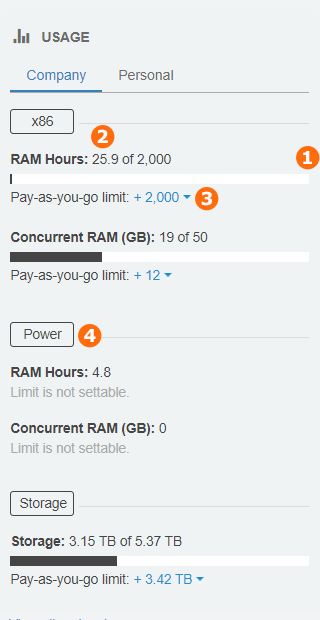 You can’t limit SVM Hours for AIX VMs in Skytap. For information about how AIX support in Skytap Cloud can help you migrate your AIX workloads to the cloud, see the FAQ section of AIX support in Skytap Cloud. The on-screen keyboard in the SRA browser client now supports many international keyboard layouts. Where possible, the on-screen keyboard layout matches the Keyboard Mapping selected on the VM Hardware settings page. Previously, all VMs displayed an English (US) on-screen keyboard, regardless of the selected Keyboard Mapping. For best performance, your local keyboard should match the selected Keyboard Mapping and VM guest operating system language settings. For more information, see Using an international keyboard with a VM. In the second major phase of the Classrooms extension beta release, we’ve added new ways to share access to classes and courses. Administrators can give Skytap standard users and users managers access to create courses and schedule classes in Classrooms extension. Previously, only Skytap administrators could use Classrooms extension. Each class includes a password-protected access link for instructors. Use this link to share the class management view with instructors who do not have Skytap user accounts. For more information about both types of access, see Managing access to the Classrooms extension. Skytap recently announced AIX On-Demand Instances. AIX On-Demand Instances introduces the ability to create powerful, blended environments with AIX workloads (running on Power Systems), and Linux and Windows workloads (running on x86 architecture). Like other Skytap environments, these can be templatized, cloned, and provisioned in just minutes. This month, private beta customers can begin exploring AIX On-Demand Instances. Skytap supports VM audio input and output via a special RDP connection type in the Secure Remote Access (SRA) browser client. For instructions about configuring Windows Server 2016 VMs to use audio over RDP, see Enabling audio for a VM. To give you better visibility while the RDP session is waiting to load, the browser client now displays a thumbnail preview of the VM desktop. This thumbnail is displayed after the VM is booted and as soon as the operating system becomes responsive. 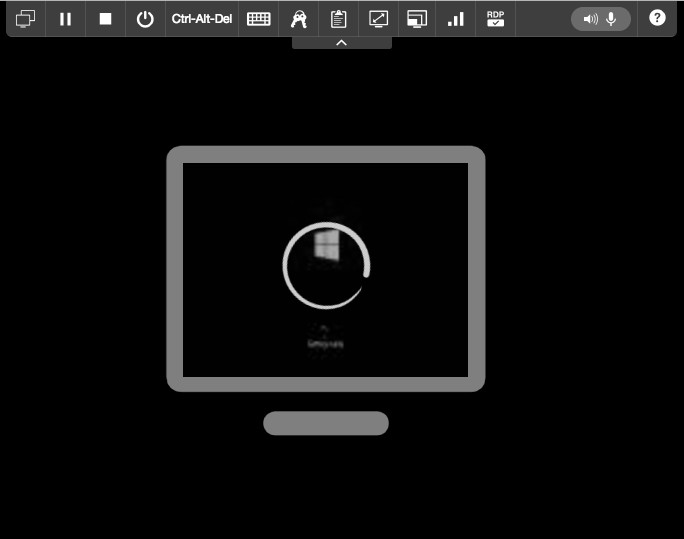 A spinning icon indicates the RDP session is still waiting to load. If you see an error message on the VM, or if the RDP session doesn’t start, you can easily switch out of the RDP session to troubleshoot the VM. For more information, see Using audio with a VM. The VM thumbnail image will also appear briefly while the VM is loading in standard browser client sessions. We’ve updated the look and feel of the dialog windows for editing user and department usage limits. As part of this change, the Do not set a limit option is now named Use max. When Use max is selected, no limit is applied. For information about setting user and department limits, see Setting usage limits. Skytap uses Transport Layer Security (TLS) to secure the connection between your local browser and Skytap (https://cloud.skytap.com). On June 6, 2017, Skytap is ending support for TLS v1.0. If you use a recent version of Chrome, Firefox, Safari, Microsoft Edge, or Internet Explorer 11 to access https://cloud.skytap.com, this change is unlikely to affect you (TLS v1.1 and v1.2 are supported by these browsers by default). If you use an unsupported browser, or if you have scripts and custom applications, you must make sure your browser and scripts can support TLS v1.1 or v1.2. For more information, see our notice about the TLS v1.0 deprecation. The Skytap integration for Canvas is a new Canvas application that gives students access to on-demand Skytap lab environments during their self-paced training courses. This application automates the steps for creating and managing virtual lab environments, allowing students to quickly provision their own lab environments for applied, hands-on training. Provisions a student lab environment from a Skytap template. The lab environment includes pre-configured virtual machines and networks. Starts the VMs in the environment. Provides the student with sharing portal access to the lab environment. (Optional) Deletes the lab environment at a specific time or after a certain number of hours, days, or weeks to help manage storage and SVM usage. To get started, see Install and configure the Skytap integration for Canvas. The Skytap dashboard now features links to Skytap Academy courses that teach you how to build, use, and manage virtual environments in Skytap. Use the free, self-paced courses to train new employees or expand your own Skytap skills. Don’t see Getting Started in your dashboard? Click to edit the Getting Started display settings. In March 2017, Skytap introduced support for VM audio input and output over the Secure Remote Access (SRA) browser client. This release, we’ve improved the experience for sharing control of audio input to a VM. The first user to connect to the VM via an RDP browser session controls the VM and audio input. The second user has a read-only view of the VM, with audio output but no audio input. This user can click Take Control to gain control of the VM (and VM audio input). The first user’s view flips to the read-only view. The first user can regain control of the VM by clicking Take Control. The Take Control option appears only for VMs enabled for VM audio over RDP browser client sessions. It does not affect other shared, over-the-shoulder browser sessions. For more information, see Using audio with a VM. VM audio support is available by request. If you are a primary administrator, contact support@skytap.com to enable this feature for your account. Include your name, email address, and the name of your organization. After this feature is added to your account, you can enable audio on a per-VM basis. If you are a standard user or administrator, work with your primary administrator to request this feature. In Classrooms extension, the class end date and cleanup options can now be edited after lab environments are provisioned or while a class is In progress. Previously, these values had been locked in a read-only mode after the class was provisioned. This change allows you to extend a class or prevent automatic shutdown or deletion, if needed. Classrooms extension is a new, add-on product that extends your Skytap Cloud account and makes it easier to create, deliver, and delete training lab environments. To learn more about Classrooms extension, see Classrooms extension (private beta). In March 2017, Skytap introduced support for VM audio input and output over the Secure Remote Access (SRA) browser client. This release, we’ve made several improvements to enhance your VM audio experience. Reduced audio output bandwidth consumption by over 300%. Users will see improved performance when using VM audio output. Added UI indicators to show VM audio input status for multiple user sessions. When multiple users are connected to the same VM at the same time, only one user can control the audio input. The first user to connect to the VM receives control. Resolved bug that affected the VM clipboard when RDP was enabled. Updated instructions for Enabling audio for a VM. Removed steps for creating a Windows Task to restart the audio service; added instructions for disabling Network Level Authentication for RDP. To learn more about using VM audio, see Enabling audio for a VM and Using audio with a VM. Classrooms extension is a new, add-on product that extends your Skytap Cloud account and makes it easier to create, deliver, and delete training lab environments. We introduced Classrooms extension in the March 2017 release. Increased the maximum number of labs per course to 20. Made the class status more informative when the class contains 0 labs. If no labs have been added to a class, the class status is now Incomplete. Added indicator of lab environment status on the Class Details page. This makes it easier to see when lab environments are associated with the class. Lab environment status is N/A. The lab environment does not exist, either because it has not been created (before the class) or it has been deleted (after the class). Lab environment status is Created. The lab environment has been created and is available. This status persists until the lab environment is deleted by Classrooms extension. To learn more, view the Classrooms extension help documentation. The Skytap plugin for ServiceNow is a Cloud Management plugin that lets you request, provision, and manage Skytap environments through the ServiceNow delivery platform. Enables environment self-service by adding golden templates for Skytap training environments, demo environments, and dev/test environments to your IT catalog. Managers within your account can promote any templates from your Skytap account to the catalog. Controls usage by requiring a start date and end date for each requested environment. The environment is automatically created and deleted according to this schedule. Provides more detailed usage reporting by allowing managers to add or require usage labels for environment. These labels track environment usage by label category and value (such as customer name or cost center). The technical preview of the Skytap plugin includes workflows and building blocks for creating and provisioning sales demo environments. In subsequent releases, Skytap will add workflows for other uses cases. In the meantime, administrators who understand ServiceNow workflow concepts can create their own workflows using the building blocks provided in this plugin. For more information and to get started, see Skytap plugin for ServiceNow (beta). All of our Docker container and container registry features have graduated out of beta release and into general availability. With container management capabilities built into the Skytap web interface and REST APIs, you can create, deploy, and manage Docker containers on container host VMs. Containerized and non-containerized application components live side-by-side in a single environment that can be cloned, shared, and suspended. To get started with containers in Skytap, see Using Docker containers in Skytap (an overview). The Secure Remote Access (SRA) browser client now supports two audio options for Windows Server VMs: audio output and audio input/output. After a VM is configured to support audio, the browser client toolbar displays the available audio options to signed-in Skytap users and sharing portal users. You don’t need any special hardware to use this feature—the browser client uses your local computer microphone and speaker to transmit audio to and from the VM. VM audio expands your virtual training capabilities and enhances over-the-shoulder troubleshooting. For example, students can learn audio-dependent features of your application directly from the Skytap VM. Or, one user can work with a VM and narrate the troubleshooting steps while another user watches and learns. This feature is available by request. If you are a primary administrator, contact support@skytap.com to enable this feature across your account. Include your name, email address, and the name of your organization. After this feature is added to your account, you can enable audio on a per VM basis. To learn more, see Enabling audio for a VM and Using audio with a VM. Automatically provision, run, and delete lab environments based on defined class schedules. Perform the bulk operations needed to create multiple lab environments from the same template and add student access. Reuse the same template, VM permissions, and custom content settings for multiple classes. Displays all of the student lab environments from one window. Grants instructors full access to their students’ lab environments. Classrooms extension is in private beta release. To learn more, view the Classrooms extension help articles. Docker container support is now enabled for all Skytap customers. Most visibly, the Environment Details page features a new Containers tab with advanced controls for interacting with containers running on container host VMs. Designate VMs in your environment as container host VMs. Container host VMs are special VMs that communicate information about Docker containers through the Skytap web interface and REST API. Filter a list of environments and templates by whether they contain container host VMs. See which VMs in environments and templates are container hosts. Add container registries and advanced options (administrators only). Add containers from a container registry. Define port mapping and other advanced network options for containers. Add shared data store volumes to a container host. See container metadata for the containers across all of the container hosts in an environment. Pause, restart, stop, kill, and delete individual containers, a selection of containers, or all containers in an environment. View a summary of information for each container in an environment. View container logs and container inspection reports. View and filter a list of containers across all of the container hosts in an environment. The Public IP Addresses page has been redesigned to help administrators more easily view and manage public IP addresses. Attached to VMs or VPNs. Unattached to any resources; these can be retained for future use, attached to resources, or released back into the general collection of Skytap public IP addresses. Remaining available to your account; this number shows how many public IP addresses you can add. Filter the list of public IPs by region. By whether the public IP is attached to resources. By the number of resources the public IP is attached to. For general information about managing public IP addresses, see Managing public IP addresses. Skytap has made behind-the-scenes changes to improve the speed and performance of usage reporting. For information about generating usage reports, see Generating reports. About the Containers beta program The private Containers beta program exposes new features in your Skytap account that let you view, manage, and create containers from the web interface. Customers enrolled in the beta program are already realizing the advantages of using containers side-by-side with traditional, non-containerized components. In fact, since the initial release in August 2016, hundreds of container hosts have been created in Skytap! To enroll your account in the Containers beta program, see the Frequently Asked Questions. For general information, see Using containers (Beta) in Skytap. The Skytap Containers beta program lets you create containers using the Skytap web interface. With the January 2017 release, we’ve added more granular options for controlling the network settings and mounting volumes between the container host and the container. Choose which of the Docker networks a container is connected to. Add port mappings to enable connections to containers from external networks. Combine port mapping with published services to enable connections from the public internet. For more information, see Accessing VMs with published services. Port mapping – Make individual containers available to an outside network. Specify a container Hostname and Domain name to enable Docker container DNS to find other containers on the host. Data sharing – Mount up to 25 volumes from the container host onto the container. This enables persistent data storage that can be shared by all containers on the Docker engine host. For more information about these options, see Adding containers to a container host. With a single click, you can now add a published service to allow traffic from the public Internet to the container. Combine port mapping with Skytap published services to enable connections to the container from external networks. Port mapping is used to route traffic from an external port opening, to the container host, and then to the container. For more information, see Port mapping. You can now view the full docker inspect container report from the Skytap web interface. For older release notes dating back to 2011, contact support@skytap.com.